Light Truck Engine Tune Up & Electronic MOTOR Professional Service Trade Edition. 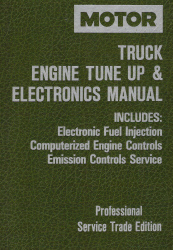 This edition covers service specifications and procedures on 1987-1992 Light Trucks & Vans. This Manual is divided into 4 sections using 3 tabs. This edition covers Chrysler / Jeep, Ford, and GM.